One-block long Jones Street feels especially tranquil and self-contained because at both ends it hits the mid-block of its intersecting streets, making it feel like a cul-de-sac. At the south end where it faces 280 Bleecker Street (1st picture --white four story building, center), an altered Greek Revival rowhouse, the quaintness of scale on the street seems almost impossible for Manhattan. The six-story Romanesque apartment building at 32-43 Jones Street (1st picture, left of screen, and 3rd picture, right) creates a monumental presence on this sedate block. To its left (2nd picture) are 26, 28, & 30 Jones Street, built in 1844 and designated as individual New York City landmarks (see also map item E). This row of Greek Revival houses typifies vernacular design of the 1840s. Of special note are the stoops, wrought-iron railings, modest temple-like entrances and dentiled cornices. To their left (2nd picture) is 24-22 Jones Street, a 1905 industrial loft building. To its left are 18 and 20 Jones Street (2nd picture, left, and 3rd picture). These two houses appear to be part of the same original row as 26, 28, and 30; however, these are not designated landmarks and therefore are vulnerable to alteration or demolition. While 18 has lost its stoop, and both have lost some doorway detail, the original designs remain largely intact, and add an air of grace to the block. To the left of 18 and 20 is the Greenwich House Pottery Building. Built in 1929 to the designs of Delano and Aldrich, the premier neo-Georgian architects of New York’s jazz age, the building adds an uncharacteristic air of nobility and grandeur to this otherwise modest block. 31 Jones Street (not visible in pictures) is a federal era rowhouse which was refaced with stucco, obscuring the original brick. However, the silhouette and form, with typical slanted roof and dormers, is still visible. 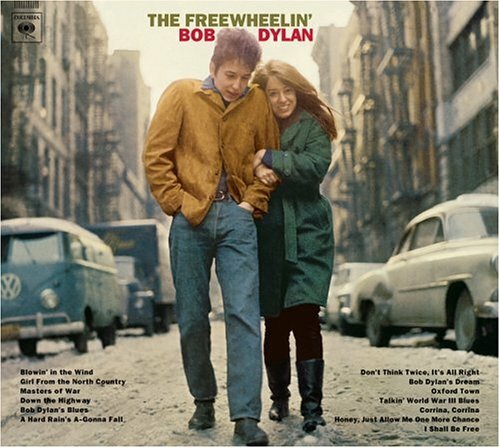 The cover for Bob Dylan's 1963 album, "Freewheelin," which contains his iconic song, "Blowing in the Wind," features Dylan and his girlfriend at the time walking down Jones Street. Dylan lived nearby at the time on West 4th Street. To see the image, click HERE.